Since Stephen Mitchell’s 2011 translation of the The Iliad came out, I’ve been telling myself that I should reread this epic poem. The last time I read it, I was in high school studying modern Greek with a tutor. This tutor came to my house each week. Seated at a round table in my parents’s shades-of-brown family room, with its faux wood-paneled walls, I’d read out loud from a modern Greek translation of The Iliad. I think maybe we discussed it? I can’t recall exactly how I felt about the poem, other than that it seemed to involve a lot of killing, trash talking, and whining gods. Four years after purchasing Mitchell’s translation and reverently placing it on my bookshelf, I finally got around to the task of reading it. Turns out, I wasn’t so off the mark with my initial assessment. Also: It’s one of the saddest books I’ve ever read, and an absolute must read for anyone who wants to understand the human condition. A quick (re)fresher: The poem comes down to us from around the eighth century B.C. and takes place during a few weeks in the Trojan War’s tenth year. The Iliad begins with Greek leader Agamemnon having to return his “prize,” Apollo’s daughter Chryseis, to avoid a plague. To compensate himself, Agamemnon appropriates Briseis, the woman who had been awarded to Achilles. Furious Achilles then retreats to his camp with his Myrmidons and refuses to fight alongside the Greeks. Meanwhile, the gods, who have their own favorites, scheme, whine, and pout on Mount Olympus, and the Trojans scramble to figure out how to escape their fate. The Wall Street Journal called Mitchell’s translation “daring,” and The Sunday Telegraph described it as “well-forged and clean-limbed.” Both are right on point. The “powerful simplicity” (The Sunday Telegraph again) of Mitchell’s prose shrinks the distance between reader and text in that the language feels very contemporary and fresh. The modern language serves to foreground how foreign the ancient world described in the poem feels. But this feeling is somewhat deceptive, illusory. Besides the horrifying exchange of women as prizes, the most obvious way the world of the poem feels distant is on the battlefield, where warriors wrapped in armor engage in hand-to-hand combat and skewer each other with spears. The battlefield deaths are gruesome, detailed, and described somewhat dispassionately. This matter-of-factness casts into relief the bald brutality of war and violence, especially because it’s juxtaposed, as in Leo Tolstoy’s War and Peace and Ernest Hemingway’s A Farewell to Arms: The Hemingway Library Edition , with cozy domestic scenes. Hector and Andromache cuddle their baby boy aware that the child will likely grow up without his father. A solder’s untimely death means he will never make it home “to pay/the debt that he owed his dear parents for bringing him up.” In other words, this is every war ever fought. One of the reasons I love this example is that it contains a timeless image that any human being reading it, at any point in history, can picture in his or her mind’s eye. When I read this, I actually visualized specific times I’ve seen this happen (though not just with little girls, Achilles!). Of course, we don’t need full-out war to hear trash talking these days. Now let’s talk about the part that may seem most distant to a modern reader: the absence of human agency. Juxtaposed against the brutality of war are the gods “at ease/in their beautiful houses,” kicking around ideas about how to mess with the puny mortals and heroes. The gods bicker and pout when they don’t get their way about letting this one or that one either suffer or survive. They scheme about how to get around Zeus’s edicts concerning who lives and who dies. But even Zeus himself can’t get exactly what he wants, as Hera reminds him that he’s not allowed to change what has been ordained. This is, ultimately, where The Iliad feels most deceptively alien: In the story, victory is not earned by mortals but granted by gods or bestowed by fate. Sure, gods and mortals have some options. Zeus can kill Patroclus sooner (and save others from dying) or later (and “increase the sorrow of even more men”). Achilles can choose to die on the battlefield and achieve glory by being immortalized in poetic verse, or he can sacrifice glory and instead choose a long, peaceful life. Basically, desirable options are thin on the ground in this story. “Having choices” does not mean getting everything one wants or exactly what one wants. Options are limited, and each has its downsides. This is, once again, where the story isn’t as different from our contemporary lives as we may wish to believe. As much as we may not like it, there are forces at work in the universe that are immune to human will. None of us is at liberty to choose from an endless array of options. We cannot, for example, choose never to die. This, finally, is what makes The Iliad so achingly sad and so important to read: It is a paradox, a beautiful epic poem that exists to tell a story of destruction, suffering, and inescapable fate. It may seem unsettling to modern readers, but isn’t this the essence of human experience? The unfortunate truth is that we all share an inescapable fate. 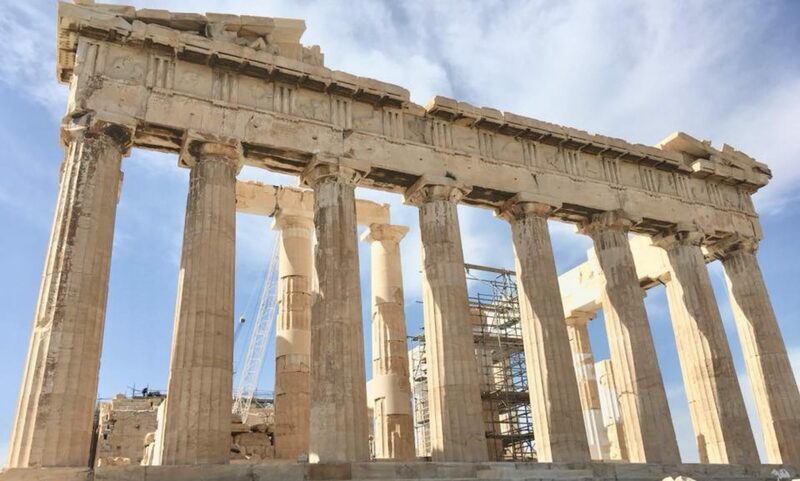 This is what the ancient Greeks understood and expressed so well: Nothing can be perfect. We cannot have it all. But we can cheat the gods and our fate by creating beauty. 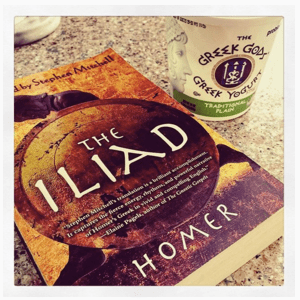 I read and really enjoyed “The Odyssey” (or at least significant portions of it) in school, but I never had much of a desire to read “The Iliaid.” I did see the movie based on at least part of it, “Troy”, but I confess that was as much influenced by Homer as Eric Bana…. Your take on the story here is really interesting. I especially love the passage you share about Patroclus being like a crying girl who gets in the way until her mom picks her up. Delightful (but I’m glad you mention that boys do that, too!). You make me more tempted than I’ve ever been to pick up “The Iliad”. Thanks for your insights and for some fresh perspectives on this epic work. This translation by Stephen Mitchell is amazing. It really transformed the poem for me in a powerful way. There is a LOT of violence, obviously, which is what had put me off rereading it for a long time. This read, though, I was so engaged by the story itself and by the interplays and juxtapositions, and I do credit the translator for bringing the story to me in a way that felt fresh and allowed me to see something new in it.